Incredibly friendly and helpful staff who went out of their way to help with booking restaurants, transport etc. for us, large sun terrace for use of all guests was great for our group of 8 staying in 4 rooms to meet during the day. From the moment we arrived the amazing staff made us feel so welcome, from booking our dinner reservations,tours, takeaway dinners to even delivering our breakfast to any location within the hotel, they were simply outstanding. At this destination you could see both sunrise and sunset and it was a nice 15 downhill walk to the hustle of Fira. I would definitely recommend to others and if we return we will not be staying at any other location than here. Thankyou so much Julie, Emma and staff you made this holiday experience simply outstanding. Staff are very friendly and helpful. Location is pretty good - close to walking path where you’ll have breathtaking views and great restaurants. Room is charming, but nothing special. Pretty good value for your money. Also, there is more to do in this area vs. Oia. Rent an ATV or Vespa to explore the island. If you stay here, I strongly recommend getting room with caldera view. However, this hotel is not situated within the caldera, which is the beautiful cliff formed by the volcano. Cheers! There is just so much to like about this place! It is in a great location!! I cant say enough about the view and sunset from here. Around 7:30 people show up to watch the sunset which is spectacular and something special. It is more on the quieter side which is what we liked most. If you want more to do and be close to shopping then Fira might be better. The walk from here to Fira is about 25-30 mins. which is fine if you don't mind walking. We got there around 10 am on the day of our arrival and our room was ready. The staff was very welcoming and helpful!! They really go out of their way to make sure you have what you need or to answer any questions. They arranged our transportation to the ferry on the day we left and then let us use the facilities until we were ready to leave at 3:30. The staff were so friendly and helpful. The location was fabulous. Location was beautiful! Great views of the sunset and caldera from the common area terrace. Nice pool, comfortable chairs for lounging around during the day. However, the best thing about this place is the staff. Everyone was so friendly and willing to help in any way. Julie made us feel special from the second we arrived until we were checking out to leave. Great location that offered privacy and amazing views. Still accessible to Fira and other parts of the island. Our stay was so magical. From the insanely helpful staff, to the beautiful accommodations, everything was perfect. Would absolutely come stay again. The view is spectacular. The staff was fantastic. The room was more than we could have asked for. Lock in a great price for Ampelonas Apartments – rated 9.5 by recent guests! In the picturesque Imerovigli Village, Ampelonas Apartments features a free-form outdoor pool, poolside bar and terrace. The Cycladic-style accommodations offer panoramic views of the Aegean Sea and of the caldera or the vineyards. Featuring internal archways and whitewashed walls, the studios and maisonettes are bright and spacious. Each comes equipped with air conditioning, TV, fridge, coffee maker and hairdryer. They all open out onto a private terrace or balcony. Free Wi-Fi is available in public areas of the property. Ampelonas Apartments is just over 1 miles from the bustling town of Fira. Santorini Airport is 5 miles away, and the port of Santorini is 6 miles away. 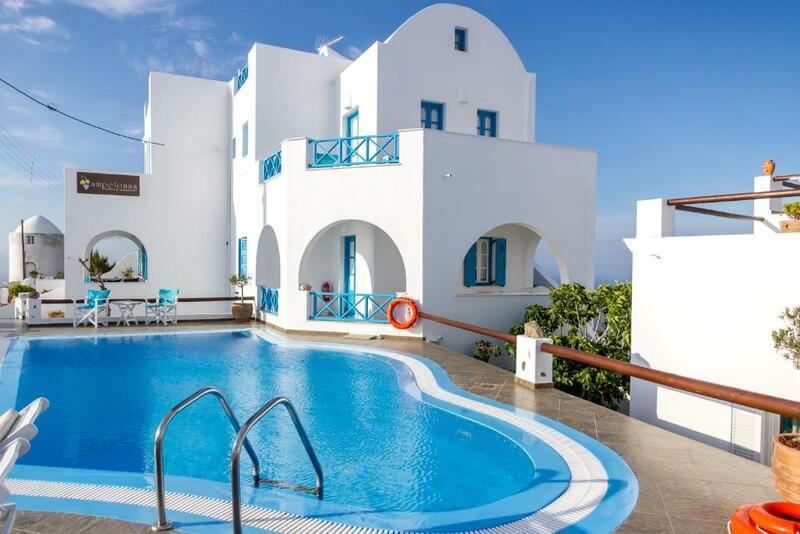 뀐 Located in the top-rated area in Imerovigli, this property has an excellent location score of 9.6! When would you like to stay at Ampelonas Apartments? This studio has a view of the vineyards. It includes a double bed, bathroom, Wi-Fi, air conditioning, refrigerator, satellite TV, hairdryer (upon request) and balcony or terrace. Please note that the kitchenette is only suitable for preparing cold meals or heating beverages. Studio with view of Thirassia Island and the Caldera. It includes a double bed, bathroom, air conditioning, refrigerator, satellite TV, hairdryer (on request) and balcony or terrace. Two-story apartment with internal staircase and Caldera view. It features a double bedroom upstairs. Downstairs it includes a double bed, sofa bed, bathroom and living room. It comes equipped with WiFi, air conditioning, a refrigerator, satellite TV, hairdryer (on request) and balcony or terrace. In perfect harmony with the natural surroundings, our Maisonettes 360 are an electrifying medley of sleek design fused with the luxury splendor of Santorini, which warmly welcomes guests to spacious, calm sanctuary for the senses. Imerovigli is a village on the island of Santorini, Greece, adjacent to the north of the island capital Fira. Imerovigli is mostly famous for its beautiful sunset, that it is called "balcony to the Aegean"
House Rules Ampelonas Apartments takes special requests – add in the next step! Ampelonas Apartments accepts these cards and reserves the right to temporarily hold an amount prior to arrival. Guests are requested to inform Ampelonas Apartments of their expected time of arrival in advance as there is no 24-hour front desk. Children under 12 years old are strictly not allowed at the property for safety reasons. Everything related to our stay was wonderful. As a comment, breakfast or connection to Airport (15 min drive) could have been included on the room price. We stayed for 3 nights and the hotel is cozy, nice swimming pool with views to Caldera. Big room with small kitchen with sink + fridge. Not possible to cook. Staff was attentive, helpful and friendly. Excellent. Perfect location, as is the highest part of the island and easy connection by local bus (running very frequently) to main towns (Phira 10 min + Ia 30 min). Phira is at a 30 min nice and easy walk distance: it follows Caldera views all the time. Emmanuel was amazing help. Hotel is basic but a great stay for the value of money. Staff are fabulous and very helpful. The staff made the place its very best. The staff were beyond lovely and helpful. Julie and Emma, in particular made our stay one to remember with excellent recommendations and genuine enthusiasm. The room was perfect and the view was beyond description! I would definitely recommend Ampelonas to anyone!!! Bed wasn’t the comfiest but that’s just personal preference. Staff extremely helpful and friendly. Great views from the property and a good location. I could be a good idea to have a microwave. Fabulous apartment we just loved everything about it.Cleaned every day and we loved the area. Staff very helpful & freindly always a pleasure to deal with. Would highly recommend a stay there to anyone and will certainly return. Thank you so much. everything . We can watch sunrise and sunset there . the staff was good service and warm . Beautiful views of both coast lines. Awesome location walking distance to many good restaurants. Really friendly staff. Perfect location, perfect view to caldera! Brilliant staff, so kind and friendly. This was the perfect accommodation, staff was extremely helpful and gave us lots of recommendations, which made our stay amazing. The sunset from the terrace was exceprional experience. Big thank you to the whole team, looking forward to come back already.